I became re-acquainted with a friend from Pakistan, who graduated from my college a few years ago. We bumped into each other and scheduled a time to grab coffee together. She requested to read my book on Pakistan, and later, critiqued some of the author’s conclusions. During a recent family trip to Washington D.C., my family stayed at the home of my grandfather’s cousin, a professor of ecology who had actually spent time in Turkey as a Fulbright scholar. We bonded with his family over authentic meals and Turkish tea. I became friends with a girl from Iran. She read about my book blog on a mutual friend’s Facebook page and wanted to join the challenge. We met a couple of times over the summer and she even started reading my book on Myanmar. I have been in contact with two Saudi students via the internet, who have offered to answer questions about their home country once Ramadan is over this coming Saturday. I reconnected with my mother’s cousin who works in the oil industry, and has traveled to several countries in the Middle East for work-related activities. My grandfather gave me all of his father’s photographs from India and Africa, which he took as a doctor in World War II. For those who do not know, Al-Jazeera is a prominent news channel originating from Qatar, covering many issues of importance of the Arab world. It has become the premier news provider to the Arab world – a great feat considering that “the connections that bind the 300 million Arabs in twenty-two countries are often abstract. It is not a military alliance, a political truce, an economic cooperative, or a simple linguistic tie. It may not even be reduced to a common religion” (page 20.) As one would expect, Al-Jazeera was originally broadcast in Arabic. 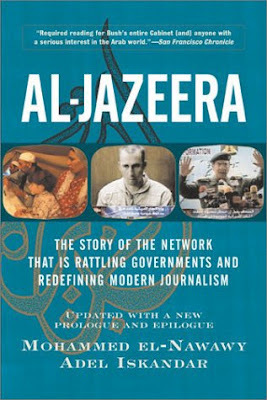 However, starting in 2006, Al-Jazeera broadened its scope to include and English-language channel. Al-Jazeera is a news agency incredibly different from its other Arabic predecessors. “Traditionally, most discussion programs on Arabic TV stations are noncontroversial and do little else but serve as a public relations outlet for governments. Al-Jazeera provided the first exposure to opposing voices…” (page 11.) To support this assertion, the authors share a media war fought by Sadam Hussein during the Iraqi invasion into Kuwait in the Gulf War. The media reported, inaccurately, that Kuwait had been taken over by a military coup, and that this group then gave the power to Iraq. Al-Jazeera strays from this tradition by following the motto of: “The opinion and the other opinion.” By following this motto, Al-Jazeera has developed love-hate relationships with many of the leaders (or former leaders) of the Arab World. Interestingly, the United States has also had a relatively tumultuous relationship with Al-Jazeera, with many believing that Al-Jazeera provided too much air time to Al-Qaeda. During America’s invasion into Afghanistan, Al-Qaeda provided Al-Jazeera unprecedented access to information and entry into the country. In fact, the interviews of Bin Laden which circulated on American news media were first provided to the Al-Jazeera network. This book was originally written in 2003 - before the introduction of Al-Jazeera English to the airwaves and certainly before the Arab Spring. Thus, it is very interesting to read the predictions of the authors that have come true. The authors believed that the open dialogues made accessible through Al-Jazeera would cause increased political mobilization in the Middle East. There is no doubt that this news network and the small country which hosts it has made a tremendous impact on its neighbors and has the ability to make an impact for many years to come. 卡塔尔半岛电视台 is what we often referred to as Qatar in China. I do take this oppurtunity to wish to express my sincere Ramadan felicitation to all my fellow members.Guys do make your Ramadan more joyful than ever. Ramadan Mubarak !